Bob Paladino & Associates, along with our notable Service Partners, are dedicated to providing each client with a full range of expert services, regardless of where you are in your CPM/Balanced Scorecard journey. We'll teach you to implement for results, which will allow you to earn your place in history books with other leading executives and their enterprises. 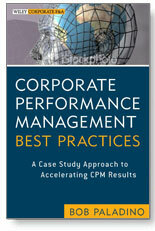 For input on developing a Hall of Fame and Best Practice CPM/Balanced Scorecard for your enterprise, contact us today. Bob began his CPM journey as the Chief Performance Officer for a publicly-traded company where he spearheaded the turnaround. He had worked in an advisory capacity for 20+ years before becoming the CPO. After the turnaround, he fielded inquiries from other companies to assist them in their performance management needs. He began writing books, which led to visiting the companies and teaching them. Formerly, as the SVP of Crown Castle International he implemented the global CPM/Balanced Scorecard program to win both the coveted Hall of Fame Award and APQC's Best Practice Partner Award. The Wall Street Journal ranked Crown as To 20 Most Improved Company out of more than 1,000 evaluated. Mr. Paladino served as a Vice President & Global Consulting Practice Leader for Drs. Kaplan & Norton. He was also a leader in PricewaterhouseCoopers Financial Cost Management Consulting Practice.